Hang around libertarians long enough and eventually one of them will start talking about "public choice theory" (I last heard it raised by a prominent libertarian scholar to justify corporations imposing adhesion contracts on their customers to force them to buy expensive consumables and service). It's a kind of catch-all theory that can handwave away any negative outcome from unregulated capitalism, the "freedom" of which is key to a kind of libertarian thought, above freedoms like "the freedom not to starve to death". The theory has its origin in John C. Calhoun, a proponent of slavery, and James M. Buchanan, an opponent of the civil rights movement. Both used the language of oppression and freedom to defend elitism, characterizing any kind of redistributive movement as a form of oppressive control exercised by the majority (poor people, which, in America, overwhelmingly means racialized people) against a downtrodden, endangered minority (the one percent, again, overwhelmingly white people). 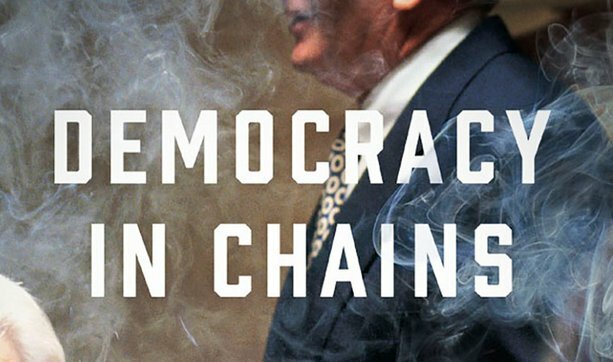 The connection between the libertarian right and white supremacy is forcefully made in Democracy in Chains: The Deep History of the Radical Right's Stealth Plan for America, Nancy MacLean's 2017 book, which attracted such a vitriolic response from the genteel face of oligarch-apologism that it bears scrutiny for that fact alone -- anything that pricks those consciences so thoroughly must be pretty interesting! As Matt Taibbi notes in his new book I Can't Breathe, "You could reduce an enormous quantity of the content on Fox News and afternoon talk radio to a morbid national obsession that could be summarized on a t-shirt: 'Are you calling me a racist?'" But yeah, that's what it boils down to. Buchanan, after all, said that the way to comply with Brown v Board of Ed was to create the "school choice" voucher system that Virginia deployed, which resulted in 100% of the tax monies allocated for public education (including the money collected from black people) going to private schools that wouldn't allow black children on the property. The fallback position for all of this is to contrast public choice theory with "Marxism" (by which the right means "Stalinism") and to assert that Marxists see the state as an ally and the right should see it as a machine for creating "rents" for people favored by politicians -- but not, you know, cronies from the donor-class; the "rents" they worry about are things like public vaccinations, subsidized housing, and public education. There is and always has been in an advanced stage of wealth and civilization, a conflict between capital and labor. The condition of society in the South exempts us from the disorders and dangers resulting from this conflict, and which explains why it is that the political conditions of the slaveholding states has been so much more stable and quiet than that of the North. Marx made a similar argument in his writings about the Civil War—except that he reversed the basic terms of Calhoun’s appraisal of the South as a paternal model of quasi-feudal social peace. Marx welcomed the Civil War and the destruction of slavery because he believed such forces would create conditions more favorable to organizing the working class, since a free labor system would no longer need to compete with slavery. In other words, the disorder that Calhoun feared, which would bring power to people of the lower order, was precisely the disorder that Marx welcomed. Calhoun is an analog to Marx, in other words, in the same way that public choice theory is an analog to the Marxist theory of the state. In the name of freedom, public choice theory would shackle the ninety-nine percent of us who exist in the lower orders of neoliberalism. Public choice theory is the Marxism of the master class. In order to reclaim the mantle of freedom, we must reclaim the anti-statism of Marxism, the liberty embedded in a theory of freedom for all. It is perfectly understandable why liberals and leftists embraced elements of statism in the twentieth century. The state not only tamed the chaos of a market-based economy that left most people deeply insecure, it also protected the rights of people in dire need of such protection, namely black Americans.